Background: Dental caries continues to be a major public health problem and most prevalentoral disease, especially among children in developing countries like India.Aim: To assess the prevalence of dental caries among 12 and 15 year old school children ingovernment schools of Marathahalli area of Bangalore city. Methodology: A cross-sectional study was conducted among 312 children (155 boys and 157girls) of age 12 and 15 year, chosen from government schools of Marathahalli area of Bangalore city.Clinical examination was carried out and caries was recorded using DMFT index as per WHOcriteria, 1997. Significant Caries Index (SiC index) was also calculated using DMFT data. Data wasanalysed using SPSS version 13. Chi-square and't' test were used, p < 0.05 was consideredsignificant. Results: The prevalence of dental caries in the present study was 33.65%. The mean DMFT andSiC index values for 12 year olds were 0.51}0.95 and 1.52 and for 15 year olds were 0.80}1.27 and2.16 respectively. The mean DMFT and SiC values for boys were 0.52}0.89 and 1.54 and for girlswere 0.68}1.20 and 2.00 respectively. The decayed component DT (66%) constituted the main partof DMFT scores followed by filled FT (50 %) among 12 year old age group while filled componentFT (50%) was higher than the decayed component DT (34%) among 15 year olds. Conclusion: The present study reveals a prevalence of 33.65% of dental caries with a largeamount of untreated carious lesions among these age groups. The results suggest formulation ofpreventive oral health policies and programs, which includes early identification of high-riskpatients and individualized treatment needs. Introduction : In order to remove tongue biofilm and improve breath odor, specific instruments(tongue scrapers) or toothbrushes are used. Material & Methods: This study compared the effectiveness of a manual toothbrush that has atongue scraper on the back of its head and two commercially available tongue scrapers in reducingthe tongue coating and aerobic and anaerobic microbiota of the tongue dorsum. A randomized,negative controlled, double-blind, parallel design study for three different treatment interventionswas conducted. Results: All tongue cleaners showed a significant reduction in Winkel's tongue coating scoreswith significant values of reduction (p<0.001) of anaerobic bacterial count reported with plastic andmetal tongue scraper when compared to brush scraper. Conclusion: There was an effective reduction of bacterial load on tongue dorsum with the useof tongue cleaners, with maximum load reduction by using plastic tongue cleaners. Introduction : Dental anxiety remains a barrier to dental care for a consistent proportion of thepopulation. The psychological profile of patients dentally anxious but not highly anxious is quitesimilar to normal (non-anxious) patients ' profile. Aims and objectives: To assess personality traits and prevalence of dental anxiety and to findan association between dental anxiety and personality traits in Engineering students. Materials and methods: A cross sectional study was conducted among 400 engineeringstudents aged 20-26 years with a mean age of 22.39 } 1.05 out of which 230 were males and 170were females. Modified Dental Anxiety Scale (MDAS) was used to measure Dental anxiety using a5-point Likert scale. Personality trait was assessed using the short-form revised Eysenck personalityQuestionnaire (EPQ-S) which consisted of 48 questions. Statistical analysis was done usingindependent t test and bivariate correlation with statistical significance at 5%. Results: Overall prevalence of dental anxiety was 91% (males 51%, females 40%). The meanscore of dental anxiety for males was 12.4}4.6 and for females 11.2}4.0 and difference wasstatistically significant (p<0.04). Atotal of 214(53.5%) were classifid as Extroversion, 43(10.8%)as Neuroticism, 2(13%) as Lie scale and 34(8.5%) as Psychoticism according to the scale used. Inthe present study there was no association between dental anxiety and personality trait. Conclusion: Generally Dental anxiety is gender related but in the present study males hadhigher dental anxiety compared to females. Of the four different personality traits, dental anxiety didnot show any correlation. Aim: The aim of the present study was to determine the prevalence of dental caries amongprimary school children in Sebha city, Libya. Methods: School children were examined by calibrated examiners according to World HealthOrganization oral health survey methods performing type III dental examination. Five hundredseventy-two (n=572) students between ages 6-14 years were selected and examined. DMFT anddmft scores were calculated and statistically tested for correlations with age, gender using "t" testand Analysis ofVariance (ANOVA)./5-value <0.05 was considered statistically significant. Results: The results showed that the mean DMFT was 1.07} .09 in males and 1.24} .1 infemales &mean dmft was 1.75}. 12 in males and 1.72}. 14 in females. Conclusion: This study provides a baseline data for promotion & evaluation of school oralhealth in Sebha; the findings also stress on the need to treat the school children at the early stages ofcaries development with a preventive and primary preventive approach as well as the baseline datafor any further studies in this field. Introduction: Probiotics are emerging as a fascinating field and can be the best way to preventoral diseases. There are very few studies conducted on humans using probiotic mouthrinse and thusthere is less information on its effectiveness. Aim and Objectives: To compare the effectiveness of probiotic and Chlorhexidine mouthrinsein reducing plaque, gingivitis and Mutans Streptococci count in saliva among 21-45 years oldsubjects. Materials and Methods: The trial design is a placebo-control, parallel group double blindrandomized clinical trial consisting of 14-day test period. A total of 45 study subjects were selectedfrom the out patients and randomised into three groups (15 in each group), group A (Probiotics),group B (Chlorhexidine) and group C (Placebo). The subjects were clinically examined for plaqueaccumulation using the Plaque index (Turesky etal modified Quigley-Hein plaque index 1970), forgingival inflammation using the Gingival Index (Loe and Silness 1963) and saliva samples werecollected for level of Mutans Streptococci count at baseline and after using the assigned mouthrinse. Results: During the follow-up (end of 14 days) the Probiotic and Chlorhexidine groups had lessGingival Index, Plaque Index scores and Mutans Streptococci count compared with the controlgroup, which was statistically significant. There was also a significant difference in the meanreduction of Gingival Index, Plaque Index scores and Mutans Streptococci count between theProbiotic and the Chlorhexidine groups (p = 0.04, p = 0.008 and p = 0.02 respectively), Probioticgroup being better than the Chlorhexidine group. Conclusion: It can be concluded that the Probiotic mouthrinse has potential therapeutic valueand can be used as an adjunct to regular oral hygiene practices. Health literacy is the ability of an individual to read, understand and act on health careinformation. Individuals with poor health literacy will have less knowledge about their medicalconditions and treatment, worse health status, and higher rate of hospitalization than the rest of thepopulation. Oral Health literacy is critical for people's search for and use of oral health information,adoption of healthy behaviors, decision-making and about oral health issues in the workplace,community and society. With awareness of patient's literacy skills, health information can betailored for delivery to patients in a format they can understand. Thus Oral Health literacy has beenincreasingly recognized as a necessary element to improve oral health. Increased attention toliteracy may offer an insight for addressing oral health needs and also for reducing barriers to care. Introduction: India has one of the highest rates of oral cancer in the world accounting for onethird of the total cancers and unfortunately this figures continue to rise. 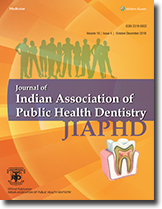 There is uncertainty andlimited recognition of the relationship between socio-demographic inequalities and oral cancer.Hence the aim of this study is to assess the socio-demographic profile of urban oral cancer patientsresiding in urban areas of Tamil Nadu, India. Methods: A cross sectional study was done at a cancer hospital in Chennai. The studypopulation were subjects with oral cancer who reported for treatment. A pretested intervieweradministered questionnaire was used to assess the socioeconomic status of urban oral cancerpatients using Kuppuswamy's scale of classification. Results: A total of 128 oral cancer patients aged 20-83 years and above comprised the studypopulation. About 52.4% of the study subjects belonged to the upper lower andl9.5% of the studysubjects belonged to lower middle socio economic classes. About 28.6% of urban subjects wereunskilled labourers. 71.9% of the study subjects had family income below Rs 5000. The percentageof illiterates was 21.9% in the study subjects. The difference in the prevalence of oral cancer amongdifferent levels of literacy and occupation was found to be statistically significant. Conclusion: This study shows that lower socioeconomic status subjects are affected more byoral cancer than other social classes in terms of education, occupation and income. Though the studyis hospital based and represents only the people obtaining treatment during the duration of the study,identifying occupation, income and education specific factors can help in formulating betterpolicies for oral cancer treatment. Saliva and its composition or constituents may be excellent tools or biomarkers for caries riskassessment. Proper understanding of salivary status of an individual would serve as a valuablemarker for assessing the risk for development of dental caries. Bicarbonates, phosphates and ureaact to modulate the pH and the buffering capacity of saliva. Macromolecule proteins and mucinsserve to cleanse, aggregate, and/or attach oral microorganisms and contribute to dental plaquemetabolism. Calcium, phosphate and proteins work together as an antisolubility factor andmodulate demineralization and remineralization. Immunoglobulins and few enzymes provideantibacterial function. Salivary components work in concert in overlapping, multifunctional roles,which can be simultaneously beneficial and detrimental for the host. Results obtained out of severalresearches have shown that salivary flow rate is the strongest indicator of caries risk. Bufferingcapacity, specific slgA against streptococcus mutans, calcium/phosphate ratio have shown a weakto-moderate association with caries risk. Other constituents have not shown a significant associationwith dental caries risk. Furthermore, in areas where controversial reports are reported, studies haveto be conducted with appropriate methodology and study design in order to obtain conclusiveevidence. By doing so, saliva can be understood in a comprehensive way and can be used as avaluable caries risk assessment tool. Background: Knowledge about the disease HIV and AIDS and their manifestations is verycrucial. Gaining knowledge about this disease starts right from II year of B.D.S. curriculum. Withproper knowledge about the disease, correct attitude is developed about how to treat the patientsaffected by the disease. Information on the HIV and AIDS-related knowledge among dental studentsprovides a crucial foundation for efforts aimed at developing an appropriate dental curriculum onHIV and AIDS, and for attracting the attention of dental school educators towards the subject. Objectives: To assess the level of knowledge and attitude about HIV/AIDS among III, IVB.D.S. students and interns of a dental college in Davangere city, Karnataka. Methods: A descriptive cross-sectional survey of the students was conducted in the institute. Aself-administered questionnaire elicited information on demography, HIV/AIDS knowledge,attitudes towards HIV testing, occupational risk perception and willingness to care for HIV patients.The survey was conducted during March-May 2011, the total number of dental students registeredwas 120 mean age 22 years). The students completed the anonymous self administeredquestionnaires in supervised class room settings. Results: A total of 69.56% correct responses were obtained for knowledge based questions.About 87.8% of dental students had a negative attitude of treating HIV/ AIDS patients. Conclusion: Students had less knowledge about various HIV related issues. The findingsclearly highlight the importance of the teaching emphasis of dental educators on the disease, and ifreinforced at an early level of study, the knowledge and attitude becomes a norm in their dailypractices as clinicians.